Fastpath: In a ticket, click Conversations, then select Events. Ticket events show all the ticket updates and notifications, whether it's by a person or by a business rule, such as a trigger. By looking at the ticket events, you can see the complete history of a ticket. Events include ticket properties that are added, removed, or changed, as well as any external notifications associated with the ticket update. Ticket events show all the updates and notifications that have occurred to that ticket. Events are not shown by default. You have the option to show ticket events alongside the ticket comments. Reviewing ticket events can help you trace the path of a ticket and troubleshoot any issues. For example, you can see whether a trigger has fired or what type of browser the end-user was using. In a ticket, click Conversations under the active comment area, then select Events. Review the ticket events displayed. The events for each ticket update appear separately. For more information about the information shown in events, see Understanding what is shown in ticket events. If a field's value was changed, the new value appears along with the crossed-out previous value, allowing you to easily see what changed. To preview the email sent for that notification, click the ID next to a notification. (Enterprise only) To view the specific version of any trigger that fired, click the trigger's title. When you finish viewing ticket events, click Events, then select Conversations. Ticket events shows ticket properties, notifications, and user information. When you view ticket events, some or all of the following might appear, depending on what was changed or added to the ticket for that ticket update. 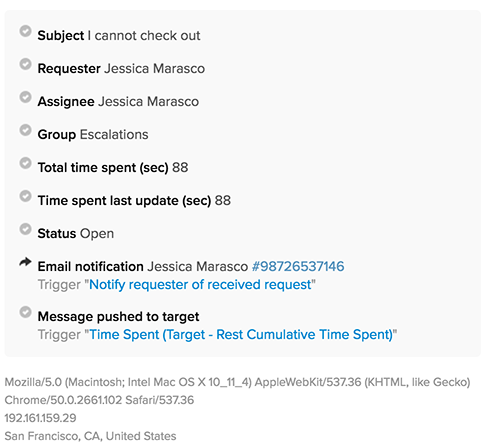 In addition to new and changed ticket properties, you can see triggers, automations, and email communications that occur in the background with ticket updates. Enterprise customers can click a trigger's title to view the specific version of any trigger that fired (see Viewing the trigger revision history). At the bottom of the information you see when you click Show all events, you can view details about the submitting users' location, browser, and IP address. Submission channel: If a ticket is submitted through a channel other than the web form, such as Twitter or email, details about the channel appear. Location: The IP location for that ticket update. Keep in mind that this might not be the same location as the actual user. I'm trying to find who commented each comments on a ticket. for example first comment is done by end-user and second comment is by agent. if there are multiple comments shared by end-user and agent. then how to find who commented each comment? I'm able to get the comment_id and author_id of each comment via data api call. how to figure out it's a end-user's or agent's comment with this information? or is there any easy way to find out? You could side-load the user info when you make your API call. For example if you hit the /audits.json?include=users endpoint, the user info loads with the ticket and user info. You can grab more info on side-loading in our API documentation here. The side-loaded information will include the users' roles as well as plenty of other information. Hope this does the trick for you! If our trigger responds after the comment has been updated, but the user indicates that they never got a response, is it safe to assume that the comment/ticket update went to spam? There are several things you'll want to check. You'll want to make sure that the trigger is, in fact, firing. You can make sure that it did by clicking on the Show all events button at the top of the conversation thread in your ticket. You'll be able to verify that the notification trigger fired in the details that will appear under the comment. Depending on how the ticket was generated in your Zendesk, you'll also want to verify that the request's email address is correct in their user profile. If both of those items check out, then you'll want to have the customer check their spam folder. How can we pickup user information using placeholders? I reviewed https://support.zendesk.com/hc/en-us/articles/203662156-Zendesk-placeholders-reference but found no reference to "Location", "IP Address" nor "User Agent". Thanks in advance for comments. That information isn't available through placeholders. Can you tell me more about what you're trying to accomplish? In the User information its a bit unclear what browser the user is using, e.g. how can they be using Chrome as well as safari - surely its one or the other? As far as displaying both Google Chrome and Safari- what is likely happening here is the ticket was submitted via Chrome, however Chrome uses elements of Apple's Mac environment, including Safari's framework, to allow Chrome to work in Apple environments. Is there a way to see this information for a ticket that has been deleted? I have some deleted tickets that I don't understand how they got deleted. Once a ticket is deleted there is not a means to view information on it in the Zendesk agent interface, and further, it is not recoverable. However, if you are on the Enterprise plan, you can see a record and the agent actor of deleted tickets in the Audit log. This can be found in Zendesk Admin Settings> Account> Audit Log. If you are not on the Enterprise plan, we may be able to provide some insight as to when and who a ticket was deleted by from our internal audit. I'd recommend submitting a ticket to us and we can go from there. Hello, I badly need help. Is there a way we can view or track all the users that had Viewed a certain ticket? What if they didn't make any modifications that did not trigger any event change or modification? is there a way to track these users accessing or viewing a specific ticket? I'm fairly certain this isn't possible, but I'm going to double check on it for you. In the meantime, can you give some more detail on why you would need to be able to do this? There may be other solutions available for you. Unfortunately we do not have that level of granular history on tickets. The events log is the extent of what is recorded and viewable. The only thing that you can indeed see is the agent collision icon (indicating if someone is on a ticket presently), but this is not recorded anywhere unfortunately. Sorry to be the bearer of bad news! I am trying to identify the IP address of the user who submitted a ticket but I can't find the option "Show all events" mentioned in this article. I clicked the Conversations drop-down and selected Events. But after that, I can't find the IP. IP address of the user is critical to troubleshoot bugs. It should be very easy to find. You should be able to see the IP address, as well as machine and browser information if available, in small grey text at the bottom of each ticket event, as shown in the screencaps above. Would you be able to send a screenshot of what you're looking at? As you can see from the attached image, there is no IP address of the user who opened the ticket. Should this functionality show if an agent has unassigned a ticket? Which piece of functionality are you referring to? Is there a way to click and see an individual ticket in oldest to newest history top to bottom? If a conversation chain on a ticket gets long and a manager needs to review the ticket, its much easier to be able to understand what has happened if we can view it with the oldest events at the top. I'm afraid it's not possible to change the order of the comments in a ticket; you'd need to scroll down to the bottom and go up from there. It's an interesting idea, though! I checked in our Product Feedback forum and didn't see a suggestion for this functionality in the agent interface, so I'd definitely encourage you to head over and create a post to share your idea with our Product Managers. It's really helpful for them to understand how our customers use Zendesk. We've even put together a post with some tips and sample questions you can use to ensure you're providing the most helpful feedback possible! You can find that here. Is it possible to show the ticket's events in a view? It's not possible to do this; there's far to much information to fit into a View. What info are you looking to see in a View specifically? I would love to be able to create a view based on the location that is tagged in the user information. Is it possible to do this? Hi Nicole, I'd like to know if I can create a view using the requester's information involving the IP address (country)? IP address is not one of the conditions available in views, but if you set up a trigger that could automatically apply a tag then you could filter a view by tag. Is there any API's to get All ticket events? Hi Sushant! Welcome to the Community! I believe that you can do that using the events endpoint in the Ticket Audits API. Could we add an event that tells us when a user downloads an attached file? This isn't something that currently exists and there isn't any workaround at this time. I see that you've already submitted a suggestion in our Product Feedback Topic, which was going to be my recommendation. We'll let you know if this is something we decide to look into! Can I use a trigger and a target to update tickets?